Posted on Friday, May 15th, 2015 at 9:08 am. I have been recently building out the end2end test suites for our MobileCaddy Seed and Shell applications. The core goal was to give Salesforce mobile application developers a starting point on which they could add their own test suites and specs, giving them a head-start when end2end testing Ionic apps. During this process I ran into a couple of “gotchas” when dealing with Ionic’s collection-repeat directive. This post should highlight the issues, propose some work-arounds and also lay the outline on how we rectify the issues we’ve seen. This post assumes you know about Protractor, if not you can read up here, but the long-and-short is that it’s a testing tool built for AngularJS applications. It is assumes you are familiar with Ionic’s (incredibly brilliant) collection-repeat directive. 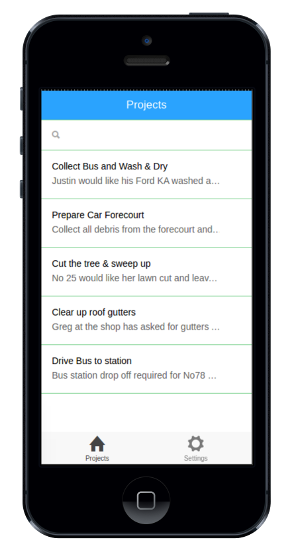 I’m going to use our Time & Expenses mobile application for Salesforce as our example (you can download it from github). The main screen of our application simply lists projects that are assigned to our currently logged in user. This list uses Ionic’s collection-repeat to populate the DOM with our projects, and with our application in test mode the list should contain 5 projects. What I want to do is use Protractor to end2end test that our app starts up and that this screen has 5 projects listed. We’re using the repeater locator to pull out the list of items in our collection-repeat and then we’re checking this against our expected number of projects… or at least that’s what we wanted to do. Expected 0 to equal 5. Let’s run our test again, and this should work right? Expected 20 to equal 5. Where did that count of 20 come from? We only have 5 projects. After digging into the Ionic code I can see that collection-repeat currently creates 20 DOM items, regardless of if there are less or not. Hmmm… so what can we do? The first step, mentioned above, is to use an alternate locator instead of repeater. But this only takes us so far. Now we’re using the binding locator and also checking that the 5th element has some content and that the 6th is empty. Of course this is not ideal, but hey, this is a work-around right… and does it work? We currently have a PR submitted to Ionic to dynamically scale the number of DOM elements created in a collection-repeat. This will remove the need to check, for example, the content of elements that shouldn’t really exist. We’ll update as both of these progress… but in the meantime we hope that our write-up here might save you some time when end2end testing Ionic mobile applications.